Creating unique, innovative horror films these days is an extremely hard task, but that’s exactly what John Krasinski and his team have done with A Quiet Place, and the final product is something quite special. The film begins 89 days into a worldwide invasion of creatures that rely on sound to hunt their prey. Now what’s different about this is that the opening scene – and most of the film to follow – is filled with silence, soft footsteps, cautious movements and sign language for communication. The audience is quickly introduced to the fact that this movie is going to deliver something different, and the notion of not being able to make a sound builds extreme tension right out of the gate and puts the viewer on edge if you fully embrace it. Basically what I’m suggesting is that while it’s fun to sit down with a bunch of snacks to relax and watch a movie, if you want to get the proper terrifying experience that this film has to offer, postpone the snacks until after, turn off anything that may make excess noise in the room, wait until it’s dark and then hunker down for some heart-pounding intensity that Krasinski’s masterful debut into the horror genre will fill your life with for 90 minutes. The story centers around a family trying to survive in a post-apocalyptic world that has seen most of its population wiped out by creatures of unknown origin that are ultra-sensitive to sound and use that keen sense to hunt and kill anything that makes a sudden noise. The family consists of Lee Abbott (John Krasinski), his wife Evelyn (Emily Blunt), their deaf daughter Regan (Millicent Simmonds) and their son, Marcus (Noah Jupe.) After a tragedy hits the family on Day 89 we jump forward to Day 472 of the invasion, and from here we witness how the family has struggled and continues to struggle with the loss each in different ways while also trying to continue to move forward and survive. What works so well with the story is that it’s clear with no words at all that this grief that haunts them all is as much a burden as the monsters that threaten their existence at every move. Krasinski smartly takes the less is more approach to the creatures in the film. We’re given bits of backstory as to how the world tried to deal with them, how they realized they hunted through sound, how they had an impenetrable armor, and that basically that the end was nigh all through a view newspaper clippings and notes on a whiteboard as the camera pans down the wall while Lee is trying to reach people on the radio using Morse code. It’s quick, yet effective and we learn all we need to know about the world they’re living in without a word and without any unnecessary explanation about why they’re there or where they came from. The family doesn’t know, so we don’t know. We learn that there are at least three of these creatures confirmed to be in the area by that same whiteboard, and that Lee has set up cameras all over his farm to keep his family protected as best he can. The family communicates in silence using sign-language, which was a fantastic touch that really allows for the film to remain silent while also furthering the plot and developing the characters. The film does have some jump scares, but it relies more on the tension building with each and every footstep or action these characters take. I found myself holding my breath a few times throughout without even realizing I was doing it because Krasinski crafts this small, intimate world so well that you feel a part of it. He also, along with co-writers Bryan Woods and Scott Beck, took a story that could’ve easily been a simple creature slaughter-fest and turned it into a horror thriller, where instead of characters being fodder for the beasts, there’s a deeper connection between them and the audience and it’s easy to put yourself in their shoes and wonder what you’d do, how you’d react and it just makes the stakes that much higher for all involved. Oh, and did I mention that Evelyn is also pregnant? Yes, in this terrifying world where making a sound can be a death sentence, on top of just worrying about their own survival the Abbotts also have to prepare their farm to be a safe-haven for a newborn baby when the time comes. Some may not like this part of the story, as how can you be intimate at a time like this? But that’s part of the reasoning behind it. Not giving up, not just laying down, but trying to survive and persist at making a life and continuing on. Now I’m also sure they didn’t plan to have the baby, but it happened and it’s now something they’re dealing with. Plus, there’s no denying that in a situation like this, being pregnant/having a pregnant wife takes the stakes for everyone involved to a whole other level. Going back to the less is more factor, Krasinski not only uses this when it comes to what the audience and characters actually know about these creatures, but also when it comes to the monsters appearing on-screen. For a film like this, the unknown is a lot more effective at striking fear into the viewer over simply having a rampaging monster show up any time a sound is made. Instead, Krasinski uses sounds, flickering lights, and brief glimpses of the beasts for most of the film in order to keep tensions high – and he succeeds in doing so. He also has such a natural eye for visuals, constantly delivering the perfect shot that the scene calls for from whatever angle it requires, all in order to keep the viewer right in on the action and the suspense cranked to eleven. On the acting front, the entire group is superb. Krasinski and Blunt are married in real life, and while that likely helped in some of the more emotional scenes, the pair are just truly great actors and their skills shine through in this film, which really sinks or swims based on the family dynamic ringing true to the viewer. Jupe is top tier in the role of the youngest, Marcus, as the fear he portrays throughout just feels so natural. Simmonds is naturally deaf, which really helps not only her character in being completely genuine, but also the actions of those around her as well. It gives reason to why they’ve all learned sign-language, and Simmonds clearly helped them all when it came to delivering the emotion needed behind the words said with just their hands. She’s also just a great actor as well, and a big piece of the heart of this film. Now I’ll admit that there a couple of things that jumped out at me both when I first watched this theatrically, and again here at home. They’re minor gripes that will be easy to overlook for some, but I’d be remiss if I didn’t point them out. First up, while I liked the quick information grab that the newspapers provided the viewer, there’s the small issue about them even existing in the first place. These creatures hunt by sound and wiped out loads of the population of earth, and yet reporters still filed stories, and the noisy presses printed the issues to get the news out? That’s a bit of a reach that late in the game. Sure, early on in the invasion I could see papers coming out to keep people informed, but I think by the time people realized they hunted by sound, there’d be a lot less paperboys tossing these things door to door on a daily basis. It’s important information, but I think it would’ve been best written on the white board as something that was discovered after newspapers had shut down. There’s also a scene where Evelyn is bringing laundry upstairs in a sack, and it gets caught on one of the basement stairs. She tugs at it until finally it comes free; however, by doing so she’s causes a nail to stick straight up that we know will come into play later on. The issue is that the nail just comes from nowhere. It’s in the middle of the step, as though it was bent down at some point so that nobody would hurt themselves on it. That’s a plausible explanation, but this is a farming family, and Lee seems like a handy guy, so if the stair (which is basically a plank of wood) did have a nail in it, I feel like he would’ve taken care of it when it was built. I mean, these are both really, really small things that don’t detract from the film. I honestly liked the nail idea! Knowing that it’s just sticking straight up is enough to make you cringe all the way until it comes into play – and then even more so then. I just wish they’d figured out a way to make it come from a place she’d still step that at least seemed like a nail would stick out from. And when a couple of minor gripes that lots likely won’t even care about are the only real issues you can find in a film, well, you know knocked it out of the park. There’s one scene that I won’t get into for those who haven’t seen it yet, but it takes place heading towards the climax of the film and it’s an absolutely brilliant piece of filmmaking. From the choice of shots, to the timing of the edits, to the score and sound design, it’s a piece of everything that makes this film as spectacular as it is all coming together at once to form what I think is the best moment in the film. For someone who has never worked in horror before, Krasinski comes off as a natural, and if this is the level of entertainment and terror he’ll continue to add to the genre, I hope he doesn’t stay away from it too long. In short: A Quiet Place is one of the most captivatingly intense, fiercely emotional, unique white-knuckle experiences of the year that shouldn’t be missed. So how does A Quiet Place look in 4K? Absolutely fantastic. If you own a 4K player then this is the way the film should be experienced. The details that shine through are beautiful, rich and it makes this realistic post-apocalyptic world feel that much more real. The HDR (High Dynamic Range) puts this version a step above its Blu-ray counterpart in quite a few scenes, really putting you into the film alongside the characters. Don’t get me wrong, if you’re only looking to pick this up on Blu-ray that version is superb as well, and sometimes on par, depending on the scenes. The transfers for both versions of the film are top notch, so whether you’ve got the 4K ability or not, picking this film up in either format is a win and something you should do. On the audio front, the sound is masterful. Dolby Atmos flows through the 4K release, and with sound being such a vital part of this film getting the transfer right for home viewing could make or break things. Luckily, both the 4K and Blu-ray versions sound fantastic, and viewers should be thrilled with either once again. Reading the Quiet: Behind the Scenes of A Quiet Place – This feature is just under 15-minutes in length and sees John Krasinski talk about reading the original script, being asked to come on board, and then the producers talking about how he brought his own vision and ideas to the story as well. They all talk about casting the rest of the characters and how Krasinski basically had everyone already chosen in his mind from when he wrote the script – well, except for Emily Blunt, as he didn’t want her to feel like she had to do it. Alas, once she read the script he’d written, it was her who asked him if she could play the part. Well, more playfully demanded over actually asking. The Sound of Darkness: Editing Sound for A Quiet Place – This feature is just under 12-minutes in length and centers on arguably the most important aspect of the film – the sound design. Here they talk about the pros and cons of working on a film that has sound at center stage, as well as Krasinski talking about bringing on one of his favourite composers, Marco Beltrami, to work on the film’s score. 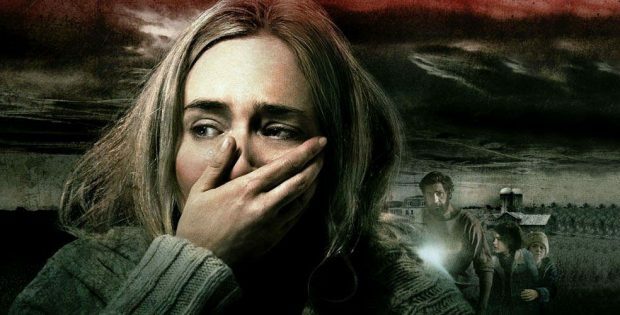 A Reason for Silence: The Visual Effects of A Quiet Place – This feature comes in at seven and a half minutes in length, and mainly focuses on the creation of the creature for the film. Krasinski and various people from ILM talk about the process of creating the beast, various iterations that they went through, and why they finally decided to go with what they did. Paramount Pictures Presents A Quiet Place. Directed By: John Krasinski. Written by: Bryan Woods, Scott Beck, John Krasinski. Starring: John Krasinski, Emily Blunt, Millicent Simmonds, Noah Jupe, Cade Woodward. Running time: 90 Minutes. Rating: 14A. Released on Blu-ray: July 10, 2018.